A pack animal, ‘normal’ circumstances for your best friend include the company of others. For rescued dogs, shuffling among homes means changing routines and social arrangements—potential sources of chronic stress. As a result, rescued dogs left alone sometimes regress into undesirable behaviors—even after having seemingly demonstrated success being home alone. These behaviors can include howling and crying; destruction of items within reach as well potential exit points such as doors and windows; and improper elimination in your home. To start, confine your dog to a crate or specific area, like the kitchen, until she has proven trustworthy of being left alone. 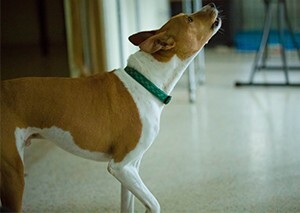 Your Basenji will be more comfortable in an area of your home where you spend time with her. So this is the best place to set up her crate or pen. Your B may need to be crate trained; take it gradually. Begin by leaving the crate where she can see and access it. This will help it become familiar. Feed her and offer treats only in the crate—this will help her make positive association between the crate and eating. Initially, your B may only be willing to stick her head in the crate to eat—good! That’s a start. As she becomes more comfortable, entice her deeper into the crate by placing her bowl further back for subsequent meals. Once she is eating comfortably inside her crate, close the door during meal time. Once she eats comfortably with the door closed, gradually increase the time she spends in the crate. But make sure to release her before she becomes frantic. Whatever happens, don’t make it a big deal. Be calm and provide comforting reassurance. You want her to see crating as a non-event—and her crate as a safe place when alone. Making a big deal—even with over praise!—at any point in the process can complicate achieving these outcomes. If there are children in your home, it is crucial they leave alone both the crate and the dog inside it. Before you leave, give your dog ample opportunity for exercise and elimination. No big ‘good byes’. Instead, keep her busy and distracted as you leave by giving her a toy such as a frozen Kong stuffed with peanut butter (plain yogurt, mashed banana, and applesauce also work well). Also, consider one of the many interactive dog toys now available. And while away, provide her calming white noise by leaving on radio or television station or calming music. If you continue to encounter challenges, it may be time to call a professional, certified behaviorist or trainer.